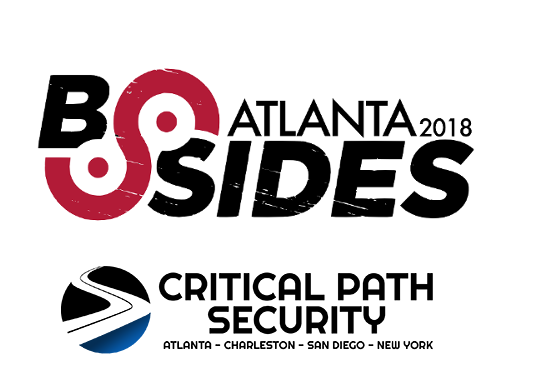 BSides Atlanta 2018 with sponsorship from Critical Path Security! CPS is proud to announce our sponsorship of BSidesATL 2018! The great folks at the Kennesaw State University Department of Information Systems, Yvette Johnson and Andy Green, has taken upon themselves to revive BSides, and we cannot thank them enough! This great tradition of the information security community was sorely missed last year by those of us that wish to push the conversations beyond the traditional. BSides is where people can present ideas and ask questions in an environment that encourages questioning the status quo. It is an intense event with discussions, demos, and interaction from participants. It is where conversations for the next-big-thing are happening. This year’s theme is “Standing on the Shoulders of Giants”, and it’s a going to spawn a ton of great talks. In today’s world of new hardware and software being released into the wild at a rapid pace from an ever increasing pool of vendors, we’re starting to see software engineers who are fluent in several programming languages but don’t know how to build, much less secure, an application server and infrastructure engineers that don’t know a single programming language. These groups are possible because of the decades of labor put in by the nerds that came before us. The guys that build simple computers in their garage that lead to the widespread use of “home computers”. The guys that wrote the protocols that lead to the Internet being as prolific and interactive as it is. Every day we rely on someone else’s hard work and dedication so we can do things like send the whole internet a slew of pings, spin up virtual machines, and, of course, hack the things. Come join us on May 5th at the KSU Campus where we will be talking about all the things! Be a part of the conversation! Critical Path Security is excited to announce that our CTO, Patrick Kelley, will be presenting at The Atlanta CPA Alliance this year!